I am lucky enough to be a proud owner of 2 pairs of uggs. I only get to wear my uggs during cold months from about october to march... so during that time you will only see me wearing my yummy lookin uggs. 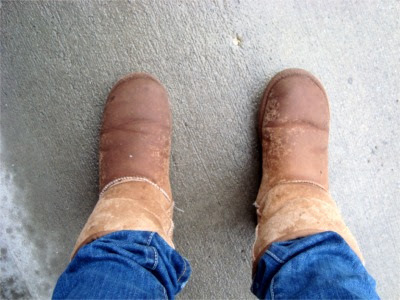 A couple days ago i got my uggs all wet in the rain. It was a sad day. Usually if i get myself into a predicament where i dont want to get my uggs wet or muddy outside, i will sacrifice staying inside than gettn my baby uggs all dirty. Thats how much i love 'em. 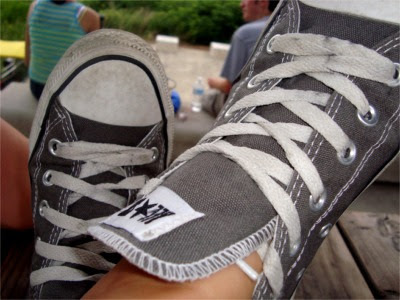 My summatime shoe loves are my sweet converse! I have them in pink, gray and black. I like to wear funky colored socks with them to make em pop out. In the summer im mostly wearing my converse but i do also wear my beloved flip flops on hotter days. Nothin screams carefree summa days than tan legs and polished toes with flip flops! I AM SO READY FOR SUMMER! This just got me so excited!! Converse and flip flops 4evaaaa!!!!! Omg i absolutely love your website! 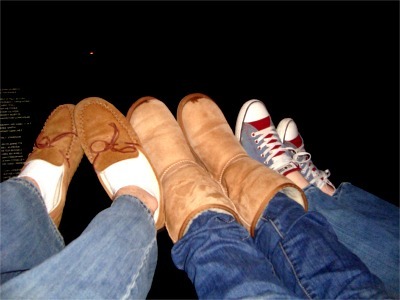 (: i love uggs too.. I got mine wet the other day in the rain.. Not as much as yours.. but still wet. Were yours ruined after that or did they just dry normally? Cuz i'm suuuper sad mine got wet! Aw thankyou so much! That means alot! haha yeah, they turned out looking better once they dried but the texture of the boot on the outside isn't as soft anymore. I bought UGG conditioner stuff and it helped alot! It smells good too :) thanks for the comment!